Urban Land Conservancy acquired the Tramway Nonprofit Center from the Phillips Family Trust in 2007 with support from Gary-Williams Energy Company (now Gary Community Investments). Located in Northeast Denver, the Tramway Nonprofit Center occupied a full city block until late 2017 when ULC began the demolition of the vacant warehouse (See Cole Train in ULC’s Assets) to address safety and structural issues. 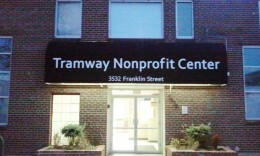 At the present time, Tramway houses more than 15 nonprofit organizations. Following the acquisition, the historic structure has undergone over $2 million in capital improvements. The Denver Office of Economic Development and Energy Outreach Colorado made these improvements possible. Meanwhile, the 115-year-old building currently serves as a long-term investment. Today, the nonprofit space ensures that necessary human services are available to the Cole neighborhood and other Denver residents. During the tour, ULC highlighted our extensive partnership with the City and County of Denver, while also providing progress updates on some of our newer developments. Future development of Cole Train, the now vacant land adjacent to the Tramway Nonprofit Center, will be determined dependent upon neighborhood needs. Both Denver Urban Scholars and Colorado Youth at Risk are tenants at ULC’s Tramway Nonprofit Center, and officially announced their merger last month. Colorado Youth at Risk is a nonprofit organization whose mission is to provide high school age students with adult mentors in the hopes that one on one coaching will help build life skills, encourage setting goals and deter students from dropping out of high school. Denver’s Early Childhood Council believes that every child in Denver should have access to quality education, and feel prepared for success when entering school. Today, D.E.C.C. currently serves over 31,000 children in the city and county of Denver. The Tramway Building Bulletin is a monthly newsletter published to keep the community informed on our facility and/or tenants! May 2016 Partner Spotlight: cityWILD! ULC is proud to announce cityWILD as our May partner spotlight. cityWILD is an extremely active member of the community, and strives to ensure that all of Denver’s youth has access to the outdoors. Read all about what is happening at the Tramway Nonprofit Center in the May 2016 building bulletin. ULC met with the most elusive staff member at cityWILD (meow), one of our tenants at the Tramway Nonprofit Center.